Have you heard about the region’s Creative Economy? This includes the industries of design, media, visual arts and handcrafted products, performing arts, heritage and preservation, and artisanal food and agriculture. 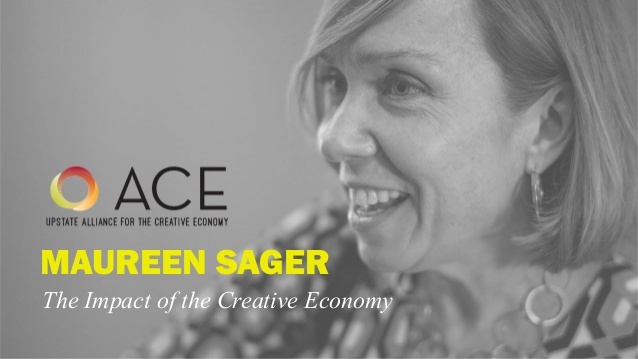 The Creative Economy is growing and Maureen Sager, the executive director of the Upstate Alliance for the Creative Economy (ACE), can tell you all about it Wednesday, October 10 at the first Albany Roundtable luncheon of the 2018-19 season. ACE is a not-for-profit organization dedicated to promoting and growing the Creative Industries in the 8-county Capital Region. Maureen is also Executive Director of Spring Street Gallery, an award-winning art and performance space in Saratoga Springs, and Executive Director of the Nordlys Foundation. Before moving upstate in 2004, Maureen was Executive Producer / Site Director of NickJr.com, the world’s largest internet site for parents and preschoolers, and had marketing roles at several MTV Networks internet brands. Other entertainment industry experience includes positions at Scholastic Inc., PolyGram Filmed Entertainment, and National Film Board of Canada. She has an MFA in Screenwriting from the American Film Institute in Los Angeles, and a BA in Economics and Film from Rutgers University. This luncheon is sponsored by The Rosenblum Companies, one of the largest developers and a full-service owner-operator of premier properties in the Capital Region of New York. Since 1979, Rosenblum has provided better spaces and real estate services to Fortune 500 companies, regional businesses, healthcare practices, government agencies, and nonprofit institutions alike. The Albany Roundtable will also present its prestigious New Patroon Award to Tom Nardacci, developer of the Troy Innovation Garage and the new Bull Moose Club in Albany. These co-working spaces support the creative economy by giving people the resources they need to fully tap their potential and let ideas run free. The cost for the October luncheon is $20, which may be paid at the door. The Roundtable also offers its guests the option of paying in advance with a credit card. The University Club will serve a hot and cold buffet from 12:00 noon to 1:00 p.m., with the program commencing at 12:30. Reservations for the October 10 luncheon are required by Monday, October 8 and may be made by prepaying online, by calling and leaving a message to register at 518-992-5360, or by sending an e-mail to albanyroundtable@gmail.com .